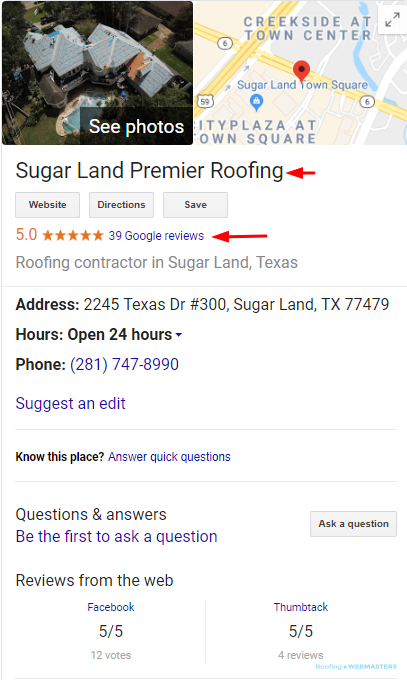 Google My Business is the central hub to local SEO for roofers. Most consumers today won’t even consider doing business with a contractor who doesn’t have both a Google My Business page and reviews connected to them. To ensure your roofing company has the best chance of ranking on local results both on Maps and traditional organic, you must fully optimize your GMB listing. That includes everything from NAP information, company photos, Google posts, and Q & A sections. A roofer’s own website used to be the main way users accessed business information. In 2019, it’s Google My Business. Among the places you can appear on Google search results, include; the local 3 pack, knowledge graph, Google Maps, and traditional organic results. A well optimized GMB page goes a long way towards improving your chances of appearing. Claiming your business is the first step of a longer process with an objective to rank at the top for relevant keywords in your service area. Having trouble getting started with the optimization process? Have no worries. Roofing Webmasters is here to help you in every way possible. Our team of SEO experts will ensure that your local listing is fully optimized, and puts your roofing company in the best position to generate leads online. Because Google My Business is a creation of the world’s #1 search engine, its value as a NAP listing is even greater than other platforms. We take this value seriously, and consider it when working on your listing. Your Google My Business page is integrated with Google’s review system. When a user searches for your company online, listings that appear on search results will be accompanied by an aggregate review rating. In other words, if you have one 5 star review and one 1 star review, your aggregate rating will show 3.5 stars. For this reason, the generation and monitoring of reviews is a crucial aspect of Google My Business. Roofing Webmasters’ Righteous Reviews widget helps contractors more conveniently generate reviews. Once users click on your listing, they can read full reviews, rather than the simple aggregate rating. Regardless of if a review is negative or positive, you should always respond, either thanking the customer for the kind words, or attempting repair a damaged relationship with an unhappy client. Always use professional language, and attempt to continue the conversation in a private setting, if possible. The Righteous Reviews widget makes the reviews process simple for customers since they can leave Google or Yelp reviews directly on your website. It also sends out text reminders to increase participation. Updated on March 8, 2019 at 10:03 pm by Roofing Webmasters.